Pasay Ceety (Tajik: Lungsód ng Pasay, Inglis: Pasay City) is ane o the ceeties an municipalities that mak up Metro Manila in the Philippines. It is bordered on the north bi the kintra's caipital, the City of Manila, tae the northeast bi Makati, tae the east bi Taguig, an Parañaque tae the sooth. Pasay Ceety wis ane o the oreeginal fower ceeties o Metro Manila. Due tae its proximity tae Manila, it quickly became a urban toun durin the American Occupation. Paz mey hae been the name o a hacienda awner's dochter, who wis bewailed bi her breukenhertit luver at her daith as "Paz-ay!". This became the name o the hacienda an in turn came tae be kent simply as Pasay. The ceety's name mey come frae pasaw an aw, a plant wi an exotic aroma, that uised grow abundantly thare. Spainyie botanist, Antonio Pineda, visitit a place cried Basal tae collect pasaw. The maist credible explanation is that Pasay wis namit efter Princess Dayang-dayang Pasay o the Namayan Kinrick, who inheritit lands nou comprisin modren-day Makati, Pasay an Baclaran. Pasay's name mey hae oreeginatit frae the Spainyie Paso hay meanin "thare is a pass". This referred tae the paths cleared amang the gress leadin tae the soothren portions frae Manila. In 1727, the auncient pre colonial name o the Pasay dounset wis chyngit tae Pineda in honour o Don Cornelio Pineda, a Spainyie horticulturist who requestit for guardias civiles for pertection frae indigenous rebellion. The name Pineda, alang wi Pasay, wis uised as the name o the place till the early 20t century. On 21 Mey 2006, SM Mall of Asia wis opened in Bay City as then the 2nt lairgest maw in the Philippines. Pasay City covers a tot land aurie o 18.50 square kilometres (7.14 sq mi), makkin it the third smawest poleetical subdiveesion in the National Caipital Region. It borders City of Manila tae the north, Parañaque tae the sooth, Makati an Taguig tae the northeast, an Manila Bay tae the wast. The ceety can be dividit in 3 distinct auries: the ceety's urban aurie wi a aurie o 5.505 square kilometres (2.125 sq mi); the Civil Aeronautics Admeenistration (CAA) complex, which include the Ninoy Aquino Internaitional Airport (NAIA) an the Villamor Airbase, wi a aurie o 9.5 square kilometres (3.7 sq mi); an the reclaimit land frae Manila Bay wi a aurie o 4.00 square kilometres (1.54 sq mi). Pasay is componit o seiven (7) destricts, subdividit intae twinty (20) zones, wi a tot o 201 barangays. The barangays daena hae names but are anerly designatit wi sequential nummers. The lairgest zone wi a aurie o 5.10 square kilometres (1.97 sq mi) is Zone 19, which covers barangays 178 an 191. The smawest zone wi a aurie o 10 hectares (25 acres) is Zone 1, coverin Barangays 1 tae 3 an 14 tae 17. Philippine Airlines is heidquairtered in the Philippine National Bank Financial Center beside the World Trade Center Manila in Pasay. Spirit of Manila Airlines haes its heidquairters in Roxas Sea Front Garden in Pasay. Cebu Pacific an Interisland Airlines hae thair heidquairters on the grunds o Ninoy Aquino Internaitional Airport an in Pasay. Naitional govrenment offices foond in Pasay include: Depairtment o Foreign Affairs (DFA), Senate o the Philippines, the Philippine Depairtment o Trade an Industry's export promotions agency – the Center for International Trade Expositions an Missions (CITEM) – locatit in the International Trade Complex's Golden Shell Pavilion, an the Overseas Workers Welfare Admeenistration (OWWA). The main office o the Philippine National Bank is locatit in the cceety. LBC Express heidquairters locatit at the Star Cruises Centre in Newport Cybertourism Zone o Pasay. The City is kent for its entertainment – business-restaurants, coffee shops, an clubs, parteecularly those locatit alang Roxas Boulevard, facing Manila Bay. A lairge pairt of Metro Manila's "tourist belt" is locatit in the City. Most of the attractions in the ceety are on the grunds of the CCP (Cultural Center of the Philippines) Complex, includin Philippine International Convention Center (PICC), Tanghalang Francisco Balagtas (formerly Folk Arts Theater), Manila Film Center, Coconut Palace, Product Development an Design Center of the Philippines (PDDCP), Philippine Trade Training Center (PTTC), World Trade Center Metro Manila (WTCMM), Cuneta Astrodome, Aliw Theater, an theme parks Star City, Nayong Pilipino, an Boom na Boom. Pasay is hame tae the heidquairters o the SM Group of Companies an the SM Mall of Asia, toutit as the seicont biggest maw in the Philippines which opened on 21 Mey 2006, an Mall of Asia Arena wis opened in 2012 which wbecame ane o the biggest sports arenas in the Philippines wi the seat capacity o 20,000 an the new hame o University Athletic Association of the Philippines an the National Collegiate Athletic Association. An aw interestin is a buddin strip o restaurants at the corner o EDSA Extension an Pres. Diosdado Macapagal Ave. It is the hoose o boomin caw centre business industry in the Philippines due tae vast land space available locatit in the reclamation aurie an aw. Panoramic view o the SM Mall of Asia, ane o the lairgest shoppin maws in the warld. Ninoy Aquino Internaitional airport, the main gatewey tae the Philippines. The Baclaran Station o LRT Yellow Line. This ceety haes 2 railweys. The follaein railweys are: LRT Yellow Line an MRT Blue Line. 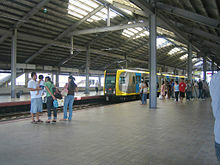 The depot o LRT 1 is locatit alang Airport Road near Ninoy Aquino Internaitional Airport. On the Leet o largest running events in the warld is based on the nummer o pairticipants a record o 209,000 registered runnin enthusiasts pairticipatit Sunday’s 2012 Kahit Isang Araw Lang : Unity Run which stairtit an endit at the SM Mall of Asia grunds in Pasay. The seicont edition o the race surpassed the Guinness World record o 116,086 pairticipants postit in the Run for Pasig River on 10 October 2010. Aliwan Festival - ivery month o Dizember an Apryle. Aliwan Fiesta harnesses the pouer o Philippine festivals tae showcase hou releegion, cultur, an tradeetion are woven intae the feebre o oor existence. Tradeetional fiestas, which are held annually tae commemorate the foondation o a toun or province, or honourin its patron saunt, are brocht thegither en masse tae hielicht the Pinoy’s indomitable an ebullient spirit, thegither wi his mien for creativity an innovation. Wi maist major fiestas ruitit in the pre-colonial period, thare is understandably a festival sector that celebrates Natur’s boonty. Oor Filipino forebears worshippit pagan gods who, tae thaim, wur responsible for boontiful harvests on land an sea. Nina Girado - a Filipino pop/R&B sangster, occasional sangwriter, record producer, TV an radio personality at ABS-CBN. Pablo Cuneta - Umwhile Pasay City Mayor an Rizal Govrenor. Faither o Sharon Cuneta. Sharon Cuneta - a multi-awairdit Filipino sangster, actress an TV host dubbit The Megastar of Philippine Entertainment. Anita Linda - is a twa-time FAMAS awaird-winnin an Gawad Urian awaird-winnin Filipino film actress. A romantic lead in her youth, she later gained creetical acclaim for her portrayals in maternal or elderly roles. Maricel Laxa - is a Filipino comedian an actress. She performit in the 1992 movie "Iisa Pa Lamang" for which she wan Best Supporting Actress awairds in baith the 1992 FAMAS Awairds an 1992 Star Awairds. ↑ 2.0 2.1 2.2 "City Profile". asay City Government. Retrieved 5 December 2012. ↑ 3.0 3.1 "Population and Annual Growth Rates for The Philippines and Its Regions, Provinces, and Highly Urbanized Cities" (PDF). 2010 Census and Housing Population. National Statistics Office. Retrieved 2012-12-05. ↑ 4.0 4.1 4.2 "Kingdom of Namayan". About Pasay. Pasay City Government. Retrieved 5 December 2012. ↑ "About PAL." Philippine Airlines. Retrieved May 19, 2009. ↑ "Contact Us." Spirit of Manila Airlines. Retrieved September 13, 2010. ↑ "Call Center / Guest Services / Product Ideas." Cebu Pacific. Retrieved March 31, 2010. ↑ "Contact Information." Interisland Airlines. Retrieved August 11, 2010. ↑ Calapre, Frank (23 January 2012). "Unity Run sets record participants". Manila Times. Retrieved 6 June 2012. Wikimedia Commons haes media relatit tae Pasay City.